Shopping in Panama on the world’s longest pedestrian-only street offers bargains galore for those who enjoy shopping until they drop. Prices can be 20% to 30% below the already-low prices in other Panamanian stores. London has its Petticoat Lane, Dublin has its Grafton Street, but shopping in Panama means the mother of all shopping streets: La Central. It may be two miles long. I gave up after a mile. Pedestrian-only shopping is not a new concept. In the 1960s, storeowners fought tooth and nail to stop them because they feared losing business. History has shown that, far from curbing sales, pedestrian-only streets actually boosted them. La Central is the place for cheap shopping in Panama. It is near the waterfront in the San Miguel district of Panama City. 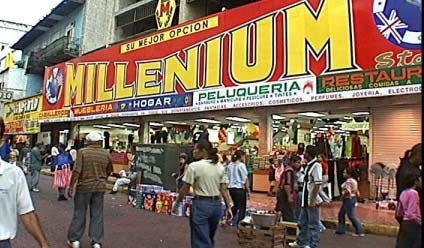 It opens at 10 in the morning and closes at 10 at night – but San Miguel is a poor district and I was advised not to shop there after dark. However, there was a strong police presence when I was there during the day. Just keep your eyes open for pickpockets, don’t flash cash, and use all the commonsense precautions you should take shopping in Panama or in any busy place anywhere in the world. I tried to walk the entire length of La Central, but I gave up after a mile; this is one pedestrian shopping street that seems to go on forever. There are plenty of restaurants where you can rest you weary shopper’s feet – there is even a McDonalds. Two stores really caught my eye. One sold an enormous selection of silk plants, including a 10-foot high imitation palm tree. One aisle had hanging vines; another had just leaves, another a huge selection of flowers. Home design heaven? Let me put it this way: Martha Stewart would love it. Perhaps she should come shopping in Panama. This store had the biggest selection of silk plants I have seen anywhere – Hong Kong’s Kowloon district included. Across the street was a great “guy” store, selling army surplus uniforms, camping equipment, mace-type “bear spray” (bears in Panama?) and, of all things, guitars. Perhaps the concept is that you hike out to the wilderness, set up your tent, and then serenade your love by the light of the moon. I asked one storeowner why his prices on appliances were so low. I estimated they were 20% to 30% below others I has seen. La Central, he informed me, was the Hong Kong of Central America, and with a free trade zone not 50 miles away why shouldn’t the prices be rock bottom? Pedestrian only shopping streets are not everybody’s cup of tea – try telling that to my brother and sister-in-law, vacationing from Britain, and bent on doing some shopping in Panama. I practically had to drag them out of the area.